Future chefs have access to all of the latest culinary tools in MSU’s upgraded learning labs. Extensive renovations to 9,974 SF on the lower level of the Kellogg Center include a variety of changes, involving transformations to the production and teaching kitchens. An upgraded and informative new entrance “hall of fame” welcomes students and visitors, introducing the history and worldwide accomplishments of the school and its alumni through a variety of displays. The dining room serves as a multi-functional space that can also be set up for meetings and instruction. 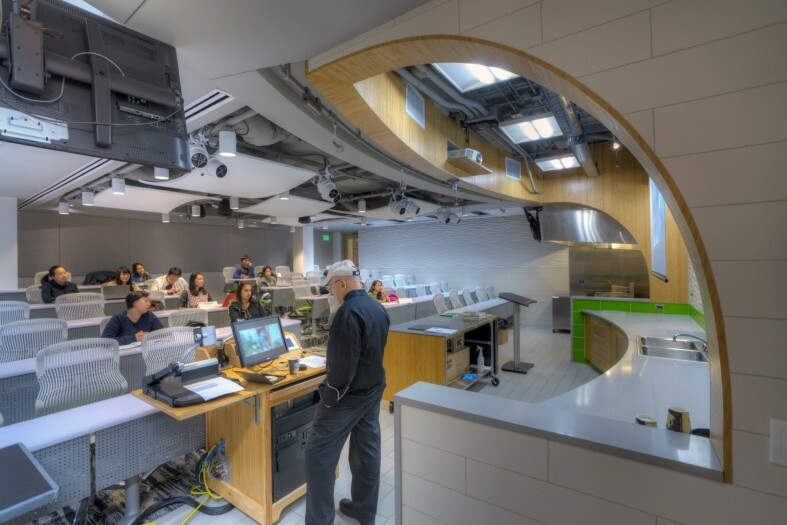 The lab kitchens serve as interactive space to showcase new vendor equipment and serve as a teaching area with individual student instructional modules. The demonstration kitchen features tiered seating for 60 with state-of-the-art food preparation and audio visual equipment. The auditorium, kitchen and dining room are equipped to receive and broadcast closed circuit television. Careful selection of materials, color, textures, and lighting are used to heighten the sense of drama and excitement throughout this unique learning environment.